Gallia Academy senior Arianna Jordan, right, dribbles past Point Pleasant defender DaNayla Ward during the second half of Thursday night’s girls basketball contest in Point Pleasant, W.Va.
POINT PLEASANT, W.Va. — This Hunter turned into the hunter … and eventually became the hunted. 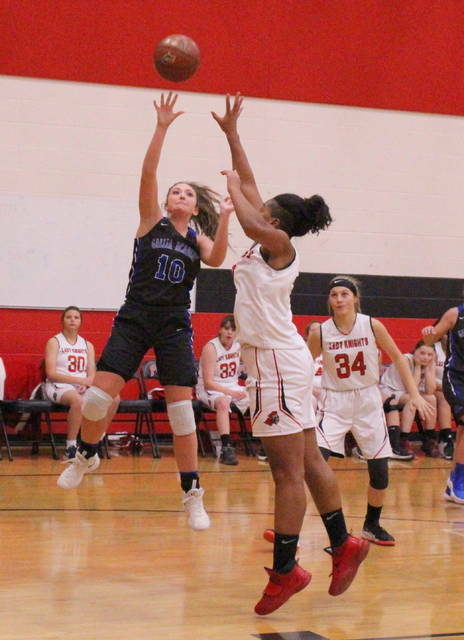 Senior Hunter Copley poured in a career-high 27 points — including 13 second half points from the free throw line — while helping the Gallia Academy girls basketball team remain unbeaten on Thursday night during a 57-47 decision over host Point Pleasant in a non-conference matchup in Mason County. The Blue Angels (2-0) never trailed in the contest as the guests made eight of their first 14 field goal attempts en route to building a 19-3 first quarter advantage. Early in the second quarter, however, junior guard Alex Barnes — a two-year starter and all-district performer a year ago — went down with an ankle injury and did not return to the game. That left the Blue and White without their primary ball-handler the rest of the way, and the Blue Angels ended up asking a little bit more of everyone on the roster. 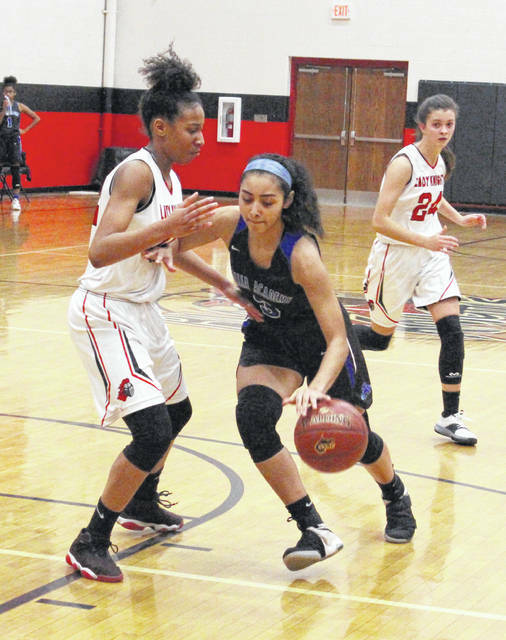 The Lady Knights (0-2) — who went 8:35 without a field goal between the first and second frames — started mounting their comeback charge shortly after the Barnes injury. The Red and Black trailed by as much as 30-9 with 2:15 remaining in the first half, but the hosts countered with an 8-0 run the rest of the way to close the gap down to 30-17 headed into the break. Point Pleasant made a 9-5 run to whittle the deficit down to single digits (35-26) with 2:40 left in the third before Gallia Academy countered with a small 5-2 spurt for a 40-28 edge entering the fourth. The Blue Angels increased their lead to 48-34 with following a Maddy Petro basket at the 6:22 mark, but the hosts rallied with an 11-2 surge over the next four minutes. DaNayla Ward capped that run with a pair of free throws with 2:32 remaining in regulation, trimming the deficit down to two possessions at 50-45. Point, however, was never closer as the guests followed with seven straight points as part of a 7-2 run to close out the game — allowing Gallia Academy to escape with the 10-point triumph. Copley — who came up three assists shy of a triple-double — hauled in a team-best 12 rebounds while also serving as the team’s emergency point guard. Copley was 13-of-21 at the charity stripe in the second half and had 15 of the guests’ 27 points after the break. The Blue Angels mustered only five field goals after halftime and committed at least seven turnovers in each of the final three periods of action. The guests ended the night with 29 turnovers total. Point Pleasant, conversely, had 10 of its 29 turnovers in the opening quarter, then had more than six giveaways only once over the final three frames of play. Though it was far from flawless, first-year GAHS coach Jordan Deel was pleased with the way his troops responded to every obstacle thrown at them in their first road test of the year. On the flip side, PPHS coach John Fields was encouraged by the effort his kids demonstrated after digging such an early hole. 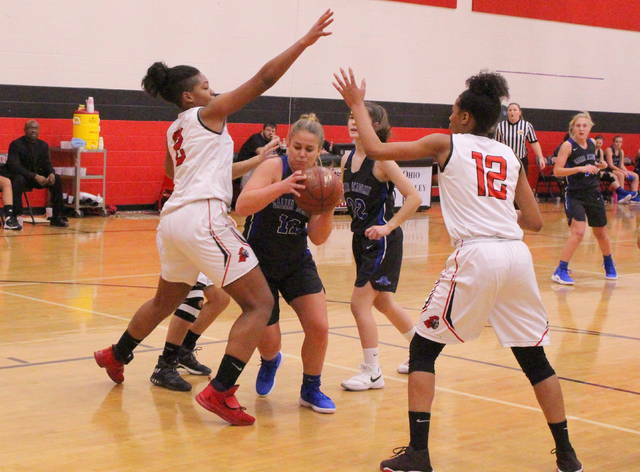 The Lady Knights ended up outscoring the Gallia Academy by a 44-38 margin after the first frame and won each of the final three quarters of action. Point Pleasant had four players foul out in the fourth quarter, while the Blue Angels did not lose a single player to personal fouls. GAHS went 21-of-44 at the free throw line for 48 percent, while the hosts nailed 13-of-17 attempts for 76 percent. The Lady Knights claimed a 44-37 advantage on the boards, including a 17-10 edge on the offensive glass. Gallia Academy went 17-of-45 from the field for 38 percent, including a 2-of-10 effort from 3-point range for 20 percent. Copley’s game-high 27 points included six points in each of the first two periods, followed by seven in the third canto and eight in the fourth. Copley also made both GAHS trifectas and went 15-of-23 from the charity stripe, but managed only one field goal after halftime. Maddy Petro was next with 11 points and nine rebounds, followed by Barnes with six points and Brooklyn Hill with five markers. Katie Carpenter and Arianna Jordan were next with three points each, while Abby Cremeans completed the winning tally with two markers. Cremeans and Preslee Reed also hauled in five rebounds apiece. Point Pleasant connected on 16-of-71 shot attempts for 23 percent, including a 2-of-15 effort from behind the arc for 13 percent. DaNayla Ward had a double-double with 14 points and 13 rebounds, while Brooke Warner also chipped in 14 points for the hosts. Nancy Vettese also recorded a double-double with 11 points and 13 rebounds. Allison Henderson was next with four points, while Lanea Cochran and Tayah Fetty completed the scoring with two markers each. Cochran and Fetty also hauled in eight and four caroms, respectively. Gallia Academy hosts Rock Hill on Monday. Point Pleasant also travels to Wayne on Monday.